Doors, Inc. has installed hundreds of Rytec© doors throughout New Jersey and New York. We are factory authorized dealers and installers for all Rytec© products. Rytec© manufactures a wide variety of high speed specialized doors, specifically designed to suit virtually any commercial or industrial application. Rytec© Spiral® doors are the best and most dependable high cycle (long lasting) and high-speed security doors available. The Spiral FV® is the fastest Spiral® model, constructed with top-to-bottom full-width window slats, providing extra safety in a cutting-edge design. The new System 4™ operating system has soft start and soft stop capabilities and can open the Spiral FV® at 100” per second while operating whisper quiet. The Spiral HZ® is Rytec’s© most durable model. It is designed for hurricane zones with galvanized steel side columns and anodized aluminum that will not corrode. It can withstand winds up to 149 mph. and impact from debris. The Turbo-Seal® series are designed for speed, durability, and efficiency. Their low profile design improves safety in confined space environments, and their unmatched durability and speed make the Turbo-Seal® series ideal for high-traffic applications. The Insulated and Freezer models are designed for freezer and cold storage applications. The Turbo-Seal SR® series are the world’s fastest, most durable, self-repairing door. It can be hit by either direction and will reset itself onto the track automatically. The PredaDoor® NXT® is the next generation of the industry’s top selling high performance rolling door, the PredaDoor®. Rytec© has added an advanced wireless safety system and made the seal tighter. It is made from durable and long lasting materials, and can sustain a hit without becoming damaged. Additionally, the NXT® Quick-Set™ repair system engages with the push of a button after aligning the bottom bar, making it the most advanced direct drive roll door available. The Fast series consists of Rytec’s© flagship models. Introduced in 1985, the Fast-Seal® model introduced the Break-Away™ concept to the United States. The technology revolutionized the durability of high speed door industry. The Fast-Fold Freezer® model was the first high speed door to be used in cooler and freezer environments. The Fast-Seal® model was the first high speed roll door to be able to sustain a hit with no damage. Packed with patented counterbalance and tension systems, the Fast-Seal® is still a standard for large exterior openings to this day. 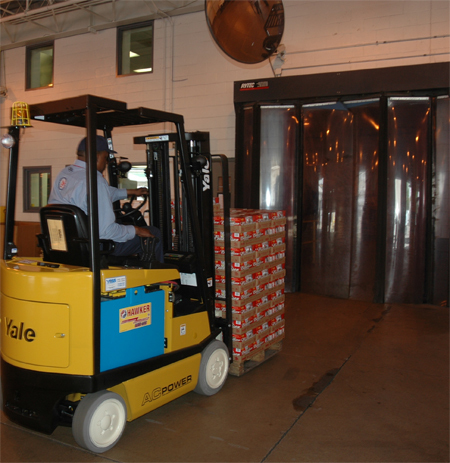 The Clean-Roll® is the only USDA-compliant high-speed roll door. It meets the standards of FDA, NSF, and ISO as well. Constructed with stainless steel and USDA compliant materials, the Clean-Roll is designed to withstand regular and complete washdowns. The Drip-Safe option is available, when implemented, it prevents residue from dripping off the open door and onto products as they pass through the door. The Powerhouse™ SD and XL combine Rytec’s© speed and durability with a virtually indestructible material Styrene Butadiene Rubber (SBR), and with the lack of wearable parts, they are practically maintenance free. They are ideal for heavy industry applications, such as mining, waste management, mass transit, manufacturing plants, and large equipment. The SBR makes these doors wind, pressure, and temperature resistant. The Pharma-Seal® is designed to comply with pharmaceutical needs and meets the requirements of cGMP, FDA, and USDA. It is the tightest sealing, most reliable, high performance door available. The door has no external parts and the stainless steel enclosure is easy to clean. It also utilizes the RyBeam™ light curtain safety system, and is manufactured to provide uninterrupted reliability. The Plexline™ door is ideal for use in high traffic indoor applications. It is fast, safe, and durable, all while maintaining aesthetics. Constructed with fiberglass composite material, the door is strong, it lives long, and it is easy to clean, making it very versatile for a variety of applications at a remarkably low price. The door’s safety features include a reversing pneumatic edge, thru-beam photo eyes and an optional counter-weighted manual break release to ensure safety. The Bantam door is an economical fabric dock door operated by a pull-chain hoist. It can also be motorized and controlled via push button. It features the aesthetics of the PredaDoor®, for a fraction of the price. The Wynd Star® is designed exclusively for car wash and similar applications. It is made from corrosion proof materials providing longevity. The door features UV resistant vinyl windows, maintaining aesthetics. The Pathwatch™ safe light system ensures safety in the high-speed industrial door environments. The Pathwatch™ light system is effective, intuitive, and completely customizable to suit your door safety needs. The lights can be easily seen at any angle or direction of travel, alerting pedestrians and vehicle drivers in advance the door is about to operate. The state of the art System 4™ door controller features integrated AC Drive, pre-programmed menu options and self-diagnostic capabilities. The controller is smaller, smarter, and more efficient. The intelligent processor and variable frequency drive generate an energy efficient speed curve that allows for smooth and quiet motion with soft starting and stopping. They are also equipped with a non-adjustable cycle counter with LED readout.